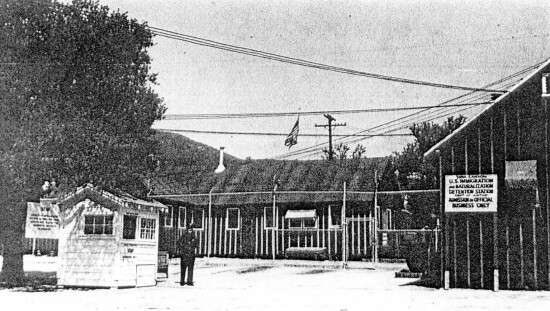 Located seventeen miles from Los Angeles, in Tujunga, California, Tuna Canyon was the site of an old CCC camp, converted to a temporary holding facility for enemy alien men, although a small number of women were held there as well. The inhabitants were mostly of German and Japanese ethnicity, a number from Latin American countries. Wooden barracks, divided into 2 man rooms, housed the inmates. Although the camp had a capacity of 320 people, it seldom held more than 100. Barbed wire fences surrounded the site, and visits from family members were conducted through the fences. Only English could be spoken, effectively cutting off almost all communication for some prisoners.The site had a small hospital, and a doctor visited daily. There was a canteen and, a rarity at internment sites, a 50×50 foot swimming pool. A minister held Protestant services, in English, on a weekly basis. The camp closed its doors in 1945. Attempts to create an historical designation for the one acre set aside as a memorial to the Station, until recently were met with opposition from developers, who propose construction of homes in the area. No remains of the Station exist, razed in the construction of the Vurdugo Hills golf course in 1960. 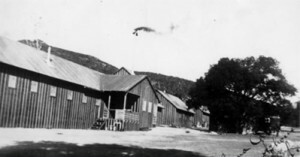 On March 30, 2014, groups active in promoting an historical designation hosted a presentation about internment in WWII and the role Tuna Canyon played, at the San Fernando Community Center. In June 2015, the San Fernando Valley Japanese Community Center, Pacoima, California, and the Community Center’s Tuna Canyon Detention Station Coalition received $102,190 from a Japanese Confinement grant. The group has pursued historical recognition of the site (Los Angeles Historical Cultural Monument #1039), planned a traveling museum-quality exhibit, and in June 2017, acquired an additional $54,000 from the Japanese Confinement Grants program to continue documentation of the facility and its residents.